Retail financing helps increase online sales by as much as 18% according to PayPal Credit, the new name for PayPal’s Bill Me Later service. Whatever the name, the concept is the same; PayPal Credit and others like Blispay, Bread, and Affirm let your online shoppers buy now and pay later. Best of all, it’s risk-free for you. Before we dive in, have you heard of Blispay? Blispay offers customer financing that is free for merchants and can be used by any retailer or online seller who accepts Visa payments. Well-qualified borrowers can get approved in minutes for up to $10,000 and use the financing for in-store or online purchases. Sellers large and small can quickly get up and running with Blispay in a little as 1 day. The terms retail financing, bill me later, instant credit, and special financing all refer to ways that customers can purchase products now but pay for them later. Large retail chains and big box stores often have their own in-house bill me later type consumer financing programs. But a growing trend for both retail stores and ecommerce sellers large and small is to participate in a retail financing program such as Blispay. It’s the retail financing providers, not you, that take on the credit risk, billing, and collection headaches (if applicable). You get paid at the time of purchase just as you would any other form of payment. Nice! Giving shoppers the option to buy now and pay later with incentives like 0% interest and 6 months to pay closes more sales and even encourages buyers to increase their purchase. And we’re not talking just big-ticket items, either. With most providers, financing terms apply to the entire sale, not just specific items, so shoppers can receive financing on everything from televisions to toilet paper. Most retail financing offers have a minimum purchase value for promotional credit terms, such as $199 with Blispay and $99 with PayPal Credit. The upside for sellers is this encourages shoppers to increase order sizes to get special terms, which leads to higher order values. Make more purchases: 30% of PayPal Credit buyers wouldn’t have been likely to buy without the 6-months-to-pay financing offer. Make larger purchases: 30% of PayPal Credit buyers spent more than originally planned after learning about the 6-months-to-pay financing offer. 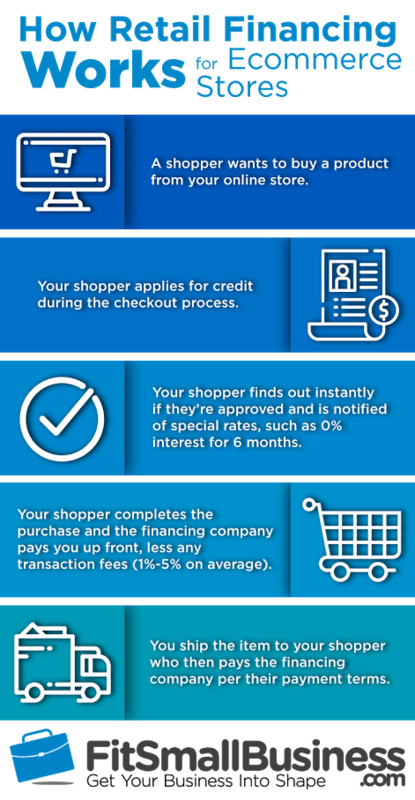 Want to use PayPal Credit again: 93% of first-time PayPal Credit buyers would likely use PayPal Credit again in the future. Would recommend PayPal Credit: 94% of PayPal Credit buyers would likely recommend PayPal Credit to others. We’ve mentioned PayPal Credit and Blispay already, but there are other players in the online retail financing sphere. When considering retail financing options for your ecommerce store, you have many providers to choose from, but all fall under two overall financing models: deferred payment or payment plan. Sellers are paid upfront with each, but they work differently from your customer’s point of view. Here’s a look at both financing models in detail, plus some top providers to consider for each. If you accept Visa payments, you can offer your customers Blispay credit. It’s that simple. Blispay set out to create a retail financing solution that makes it easy for all types and sizes of sellers to offer financing, and the program is a runaway success. In fact, there’s really no reason not to offer this multichannel-friendly financing solution to your shoppers. 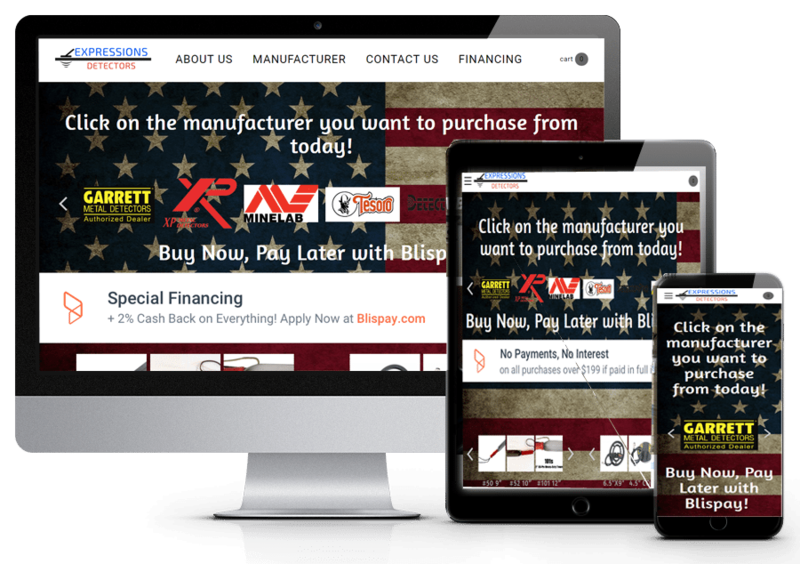 All you need to do is promote Blispay as a special financing payment option in-store or on your website. No special integrations, no added payment method, no learning curve. Shoppers see the Blispay offer and can apply via computer or mobile phone. Upon instant approval, they receive a digitally delivered Blispay Visa financing card number to use to complete their payment in-store or on your site. The payment processes with your normal Visa payments, you get paid, and your customer has No Payments, No Interest on all purchases over $199 if paid in full in 6 months. 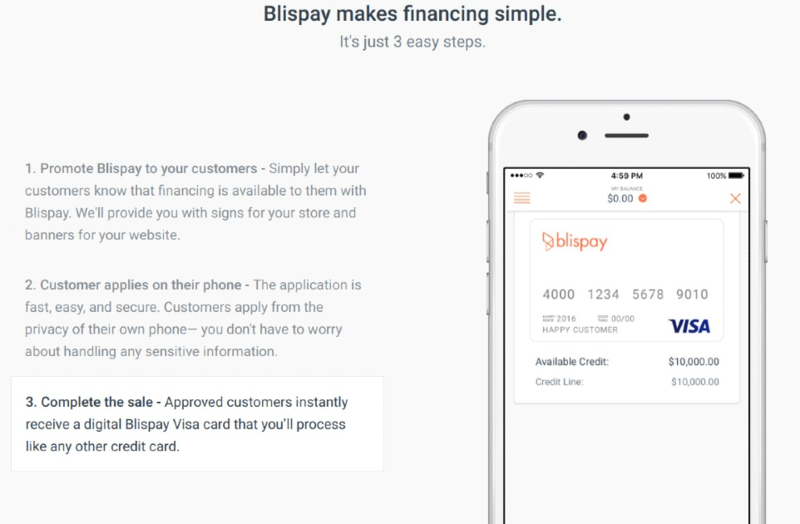 Blispay is perhaps the easiest way to offer retail financing to online and in-store shoppers, period. If you accept PayPal Payments or use PayPal as your online store’s payment gateway, you can offer your customers PayPal Credit. It’s that simple. 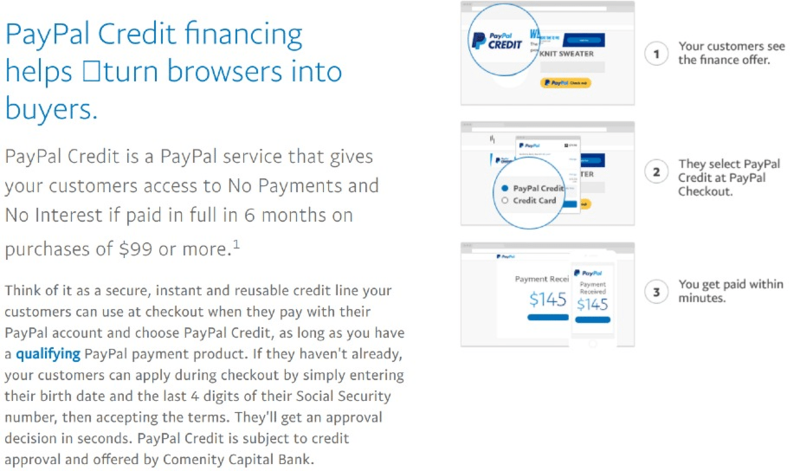 If they don’t already have a PayPal account, shoppers will need to create one to access PayPal Credit, but PayPal makes that easy and quick as well. PayPal Credit works within your normal checkout flow for PayPal, including PayPal Payments Standard, Advanced, Pro, and PayFlow payment gateways. Both Blispay and PayPal Credit work with any size seller, so they’re ideal ways for small businesses and startups to offer retail financing to shoppers. You can even offer both options to your buyers if you wish. However the next option, payment plan retail financing, works differently and is geared toward sellers who want more control over their promotional offers. Payment plan retail financing lets shoppers pay for purchases over time with set payments each month. Basically, these are installment loans that your retail financing provider makes to your shopper. You, the seller, are paid up front less your transaction fees, and the buyer pays off the purchase following the payment schedule they choose at the time of purchase. Payment plan financing offers longer payment terms, like 12, 24, and 36 months to pay, with lower interest compared to deferred payment plans like PayPal Credit and Blispay. These usually apply higher interest rates if shoppers’ purchases aren’t paid off within 6 months. Bread integrates into your online store seamlessly so customers can explore their financing options at any point as they shop your site. It integrates in a white label manner, meaning it closely ties in with your brand so you don’t see Bread’s name on your product or checkout pages where financing is mentioned. Best of all, shoppers apply and receive approval right on your website. They’re not taken to another site to apply. Bread offers retail financing terms all the way out to 36 months. If you sell larger ticket items like furniture or luxury goods, this can make a difference in conversions since it lowers your customers’ monthly payments. Bread also lets you manage financing offers, eligible products, promotional APR’s, and more to help drive sales. Bread charges a merchant fee starting at 3.1% of the total financed purchase, but has no startup fees. They generally focus on businesses selling over $2M annually, but they’re flexible, so don’t hesitate to call them if you fall just under that amount. 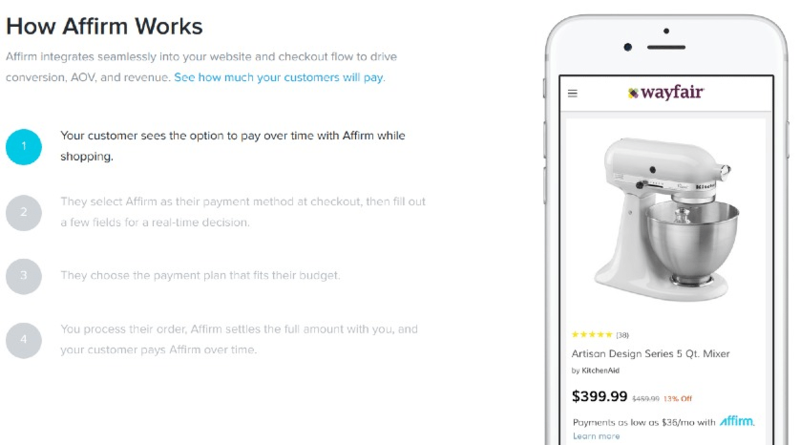 Affirm integrates into your online store to display Affirm as a retail financing option on your item and checkout pages. Like Bread, Affirm requires more set up than Blispay and PayPal Credit since it directly integrates with your online store. But that direct integration lets customers explore payment plans as they shop and gives them the flexibility of paying off larger-ticket purchases over time, up to 24 months. Affirm also gives you tools to manage financing offers, eligible products, promotional APR’s and more to help drive sales. Affirm charges a merchant fee per financed sale which varies based on the deals you offer your shoppers. Fees start at around 3% of the sale amount and, like Bread, there are no startup or onboarding fees. They also focus on businesses that sell more than $2M annually. It’s a fact that retail financing and bill me later payment options drive more and higher value online sales. Any size seller, from startups to those moving millions per year, can benefit from this trend using popular bill me later providers Blispay and PayPal Credit. Blispay works for any in-store or online merchant who accepts Visa, while PayPal Credit requires sellers to accept PayPal. That’s all the criteria you have to meet. Both are a breeze to set up and add to your existing checkout and all you have to do is promote the financing option. Other providers like Bread and Affirm fully integrate with your store so you can offer customers a wide range of long-term payment plans at varying promotional rates. But these providers charge added per-transaction fees and are really geared for sellers who want a hands-on, self-managed financing solution. Plus, they tend to have an entry threshold of $2M in annual sales. Either way, ecommerce sellers large and small have access to attractive, low-cost and, best of all, risk-free retail financing to help drive sales. With no upfront costs and simple integrations, there’s really no reason not to try them out. Do you offer retail financing or bill me later payment options to your shoppers? Which providers do you prefer? Please share your thoughts and experiences in the comments below.